A lot of homeowners prefer using hardwood flooring because of its traditional aesthetic and high durability. But there are some definite concerns that one must address. It can be quite expensive for a Do-It-Yourself project and it is also susceptible to moisture and water damage. If you are looking for an economically friendly and sturdy alternative to solid hardwood flooring, you really should consider engineered hardwood flooring for your home. Engineered hardwoods are a combination of true finished wood on top with an un-finished plywood as the base. The additional layers of plywood are laid in a cross ply patter, making it very sturdy and increasing its durability. One would think that engineered hardwood doesn't have a lot of options and it in no way compares to the real thing. Well, that couldn't be more wrong! 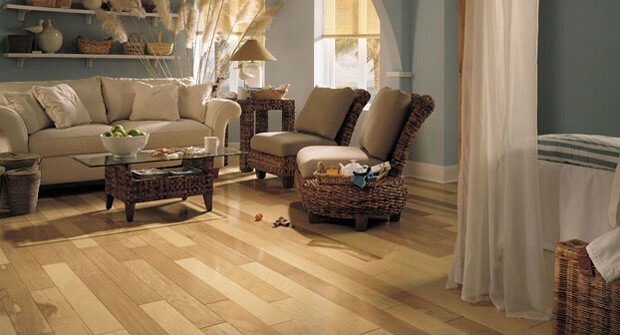 Some of the most popular engineered hardwood options include Brazilian cherry, red oak, hickory, bamboo and ash. And you would never know the difference in engineered and solid hardwood flooring from looking at it. The large variety ensures that homeowners will find exactly what they are imagining there hardwood flooring to look like. Engineered hardwood flooring is also, always pre-finished, so you will not have to worry about adding the cost of sanding and sealing to your installation bill. You can simply install it as is. But don't believe the myth of not being able to re-sand and refinish your engineered hardwood flooring! It's not true. You will be able to re-sand and refinish it at least one, maybe 2 times. Solid hardwood flooring is never recommended for high moisture areas like bathrooms and basements. Engineered hardwood floors are however much better with handling any type of moisture thrown at it. This feature makes it ideal for areas with a lot of water being spilled or one with high humidity levels. Installation is far easier with engineered hardwood floors than solid. This is because solid hardwood floors require you to nail the boards to a wooden subfloor during installation. With engineered floors however, it is possible to install it by gluing it down or even using a floating floor installation method. This is particularly important if you are interested in radiant floor heating systems for your home.